The Ceviche will probably take my life. It is Lemon/Lime and Chili (Rocoto) madness, all the ingredients for something superb. Well back to business, the Times list recommend La Mar, the Astrid u Gaston restaurant for Ceviche where we already went and where the above pic is from. 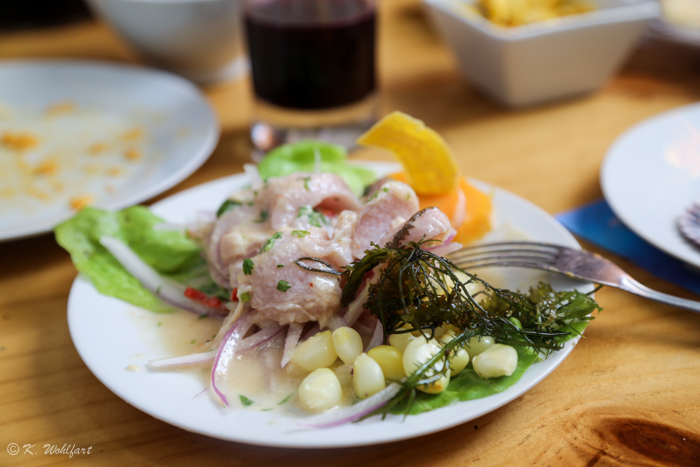 Here it is also possible to by a book or two about the Peruvian cuisine or Ceviche. Ceviche is 8th on the Time- list and you can read about it here. The funny thing about the photo they use is that I have been in Lima for almost two months now and NEVER seen Ceviche that look like that. I might ask someone where to find it. I really wan´t to know where they found this Ceviche. borrowed from the Times list. But what is so special about Ceviche anyway? Why does it deserve a fancy prancy name like Ceviche? The history of Ceviche tells me that it is a fishcourse, yeah well, obviously (I won´t go into how it´s made cause I have no idea and a simple recipe won´t help you outside Peru because of the raw ingredients that are not possible to find everywhere, and I mean, even if you find Lime it is not the same as here) and Swedish Wikipedia tells me that Ceviche is spiced up with glutamat. What? Never saw anyone put glutamat in the ceviche at home. Well the english Wikipedia tells me nothing about glutamat, relieved, but ”The dish is typically made from fresh raw fish cured in citrus juices, such as lemon or lime, and spiced with ají or chili peppers. Additional seasonings, such as chopped onions, salt, and coriander, may also be added. ” It is popular in the costal regions of central america and southamerica, but Peru is world famous for it, might be much due to this man (the one on the left)..
.. Gaston, which also Time point out. Time also thinks that when being in Peru, a good visit would be Astrid y Gaston, Casa Moreyra. the flagship of Gaston, where we also are going in May (and where Martin are doing his internship as a chef, would there be any place better!? ;). The link on times webpage, to the Astrid y Gaston restaurant, Casa Moreyra is on the other hand wrong so won´t post this, since the writing of the Times article the restaurant has moved to a fantastic building in the San Isidro area. Well, this is raw food just so you know and it is raw fish, even worse. So my best guess is that there is more than simple food poisoning you can get from this fishy fish business. Well, this is certainly tricky. I´m so not up to date on the fishing industry and in tropical water, no clue! But, overfishing is a problem everywhere so I would say, since we are so many people we overeat and overfish. But I don´t have a solution to this, do you? Is this a joke? The ceviche beats everything in the rest of the world of food. I love the Peruvian cousin and I love Ceviche. It is a top 5 of all 5s, so worth the health risks. But just a tip when ordering. One plate of Ceviche is enough for 2-4 persons at least so don´t over order and don´t overeat. It is not good for you, or nature. All photos are private, the two top photos are taken by Martin, the person on the right of the photo and the two in the bottom, by myself. They are taken with a Nikon Coolpix, by Martin and I have taken my photos with my Canon 5D. All four are edited in Lightroom. As to the photo in the Time site: it’s just another example of some dickhead photog. deciding that he knows best – but mostly because he didn’t like the way the real dish looked, so simply created one he liked. Food photog.s do that all the time. Yes. But I guess it is a true photo, and that they are using another fish than the one I am used to but have never seen this. Will ask me expert chef boyfriend and see what he says when he gets back home. Woow! All that looks So delish! Next PostA photo of a boy- What happend next?